Whilst at Crufts we met up with some great brands, some of who we were familiar with and some new product to the market. We love to see and hear about new products, as if you are anything like me you are always after the latest products for your pooch. One of those brands we had not come across before was Top Collar. Now before I explain exactly who they are and what they offer. Here are few photos from when we met them at their Cruft's stand. The lovely Sophia who owns Top Collar, was very happy to met me and Lottie and very kindly gave us some of their Sunday Dinner to review. Getting Yummy treats from the Top Collar Stall. Please tell me all those biscuits are mine. Who is Top Collar I hear you Bark? Top Collar are a UK based company offering a healthy dog treat subscription service. Top Collar is about keeping your pooch happy and healthy. They only use real human quality ingredients, and use gluten free flour for all their dog biscuits meaning they are great for those with allergies. 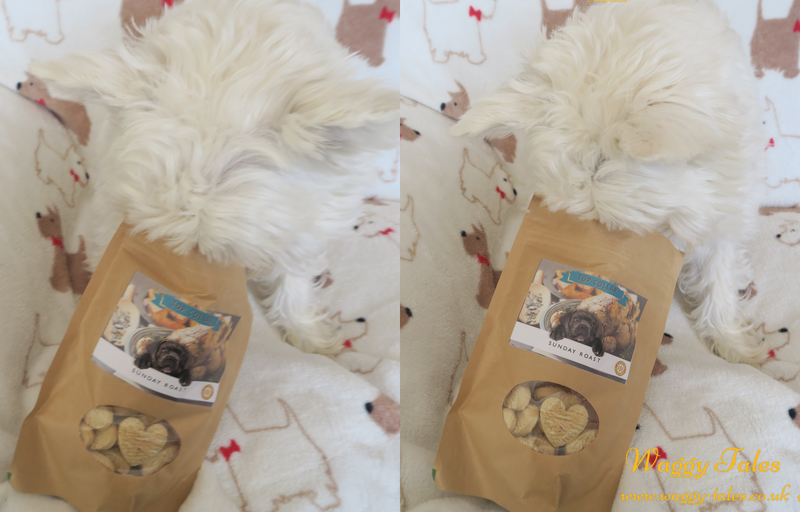 They also contain no extra sugars, fats, salts or preservatives so are a natural biscuit for your dog.As they contain natural ingredients they don't last as long as commercial treats but they delivery just after bake day so you receive them as fresh as it gets. Each box is priced at £5.99 with free postage. It is a no commitment subscriptions meaning you can cancel your subscription at any time from the members area. Boxes are sent out fortnightly on the 12th and 28th of each month, unless you choose a monthly subscription. Once signed up, you have access to the member areas which enables you to alter the frequency of your boxes or pause them for up to 2 months, great if your going on holiday. Nutritional Box - great for those pooches who are watching their waste line and want to go healthy as they are lower in fat. Discovery Box - tuck into all the recipes on their menu and have a surprise each month. Each month, all boxes contain a 130gram resealable treat bag with a health card containing information regarding the receipt of the treats inside, as well as details of what will be included in your next box. They have 6 different recipes that they choose from - Sunday dinner, Cheese and biscuits, full english, salmon and eggs, pork pie and Chicken Tangine. So there is plenty to keep your pooch interested. We were very kindly given a pack of the Sunday Dinner biscuits at Crufts, but as Sophia wanted us to experience the full Top Collar subscription service she also sent us a box of their cheese variety, through the post including their unique feature of Lottie's photos appearing on the box. This variety went down just as well, and I can say that delivery was easy as the box is able to fit threw your letterbox. Now Lottie is fed on a raw diet swe are always after healthy treats. It evident to see that Lottie loves the treats. You can really tell they are made with wholesome ingredients and don't smell like her old ones. They have plenty of crunch to them which Lottie likes in a biscuit (after all if it doesn't crunch its not a biscuit in our eyes). The resealable packets comes in really handy to keep them fresher for longer. A hassle free subscriptions means you never run of your pooches favourite treats again, and the customtions of the your pooches picture on the box really gives it that homemade feel. They are very reasonable priced for a homemade product and have the added bonus of free delivery. We would highly receommded these treats if you are looking for something natural for your dog diets. 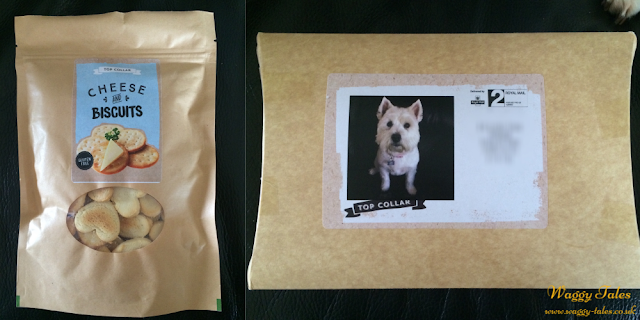 We received two packs of treats from Top Collar at no charge in exchange for our honest and fair review of their product. All opinion expressed here are our own and truthful!